Papillons can move fast for their size, so accidents are bound to happen. Papillons may be tiny, but they have a strong reputation as healthy dogs. This French breed, which has been around since the 1300s, has relatively few hereditary health concerns. While they aren't plagued by many serious genetic health issues, papillons do occasionally suffer from aggravating eye problems. Progressive retinal atrophy or PRA is a lifelong, irreversible degradation of the eyes. It can emerge early in your puppy’s life but often takes a few years before causing enough damage to produce noticeable symptoms. Still, some dogs with this disorder lose most of their vision in a matter of weeks or months Papillon are among more than a dozen species that are prone to generalized PRA, which causes progressive degeneration of the rod-and-cone structure on the eye's surface, according to Papillon 911 Rescue and Adoption. This form of PRA can affect dogs as young as 1 year old. Some papillons don't produce enough tears to keep their eyes moist, a condition called dry eye. If your dog winks frequently or if his eyes become inflamed and excrete discharge, then his body may just not be making enough lubrication for his eyeballs. Papillon puppies are also prone to hypoglycemia, which can make their eyes look glassy, according to the Papillon Club of America. 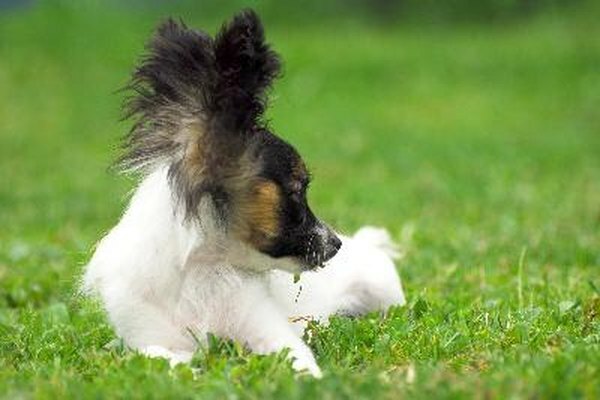 Progressive retinal atrophy is the only recognized hereditary eye disease of the papillon breed, but that doesn't mean they are immune to other problems. They can also suffer from the same general eye problems that other breeds do, including bacterial infections and physical deformities. Glaucoma, a deformity of the eyeball caused by internal pressure, and cataracts can obscure your dog's vision if left untreated. Senile cataracts were actually the most commonly reported eye problem among papillon owners in a five-year survey conducted by the Papillon Club of America. These problems can lead to partial or full blindness. Most eye problems, with the exception of PRA, can be cured with the assistance of a veterinarian. Get your puppy to the vet as soon as possible if his eyes look red or if there is noticeable discharge, inflammation or a filmy substance on his eyes. In most cases, your vet will prescribe oral medication or an eye-drop solution to combat infections. Minor surgery may be required to mend malfunctioning tear ducts, address internal problems or fix an abrasion or other physical injury. Can Ear Mites in a Cat Cause a Weepy Eye?